Breaking the clutter in what is known as Little Thailand or Golden Mile Tower is an Italian joint called PocoLoco Pizzeria. It is situated right in front of the escalator that goes down from the Rex Cinemas entrance. They have a long counter which enables you to see the chefs busy at work and the dining seats are spread out in the open. This fuss-free outlet serves quality Italian food at affordable prices. At a place that spoils you for choice in terms of Thai food, PocoLoco Pizzeria was a pleasant find. This Golden Mile Tower outlet essentially specializes in pizzas. They have other outlets in Ang Mo Kio and Jurong. Since this outlet has a limited number of seats, it is better to reserve in advance in case of a slightly larger group (more than 4 pax). The menu has the standard offerings but I missed the ‘V’ symbol clearly demarcating the vegetarian dishes. Having said that, there are quite a few options for vegetarians and they are open to a reasonable customization of pizza toppings which was nice. Apart from the standard menu, they also have daily specials mentioned on the blackboard placed at the front of the restaurant. To begin the meal on a warm note, we tried the ‘Mushroom Soup’. It had an earthy flavour and was well-seasoned. It was a decent and simple dish. Since we were informed that the main courses would take some time, we decided to try the ‘Garlic Bread Pomodoro’. The thing to note here is that this is served in the form of a pizza and is placed under the ‘Pizzas’ section on their menu. So you have to imagine this as bread that can be consumed with soup or a bruschetta serving that can be shared. It works as an appetizer and not as a pizza since it does not have toppings or cheese. The vegetarian pizza that we ordered was the ‘Ortolana Pizza’. I was able to customize the mixed vegetable toppings with some standard options like onions, bell peppers, spinach and sun-dried tomatoes. When the pizza arrived, I was pleasantly surprised to see a colored pizza dough base. We got a red color base which was from the usage of beetroot. Upon inquiring, I got to know that they serve different colors on other days of the week and that was quite whimsical. The quality of mozzarella cheese used was very good and the toppings were top-notch. The 10-inch pizza had a crisp crust and is worth ordering. If you are a cheese lover, try the ‘Bella Italian’ pizza. This pizza will tease you with a dual combination of melted mascarpone and mozzarella cheese. The easy to spread tomato sauce on the base was good and enhanced the overall taste of the pizza. The quality of cheese used in their pizzas is really good. For the fresh burrata cheese lovers, do not miss on the ‘Caprese’ pizza which is rightly marked as the chef’s recommendation on the menu. For the pasta dish, we tried the ‘Pesto Pasta’. The pasta was cooked al dente and the pesto was smooth and coated the pasta perfectly. Personally, I think the dish needed a touch more seasoning. It’s very tough for me not to order the ‘Tiramisu’ at a Italian joint. 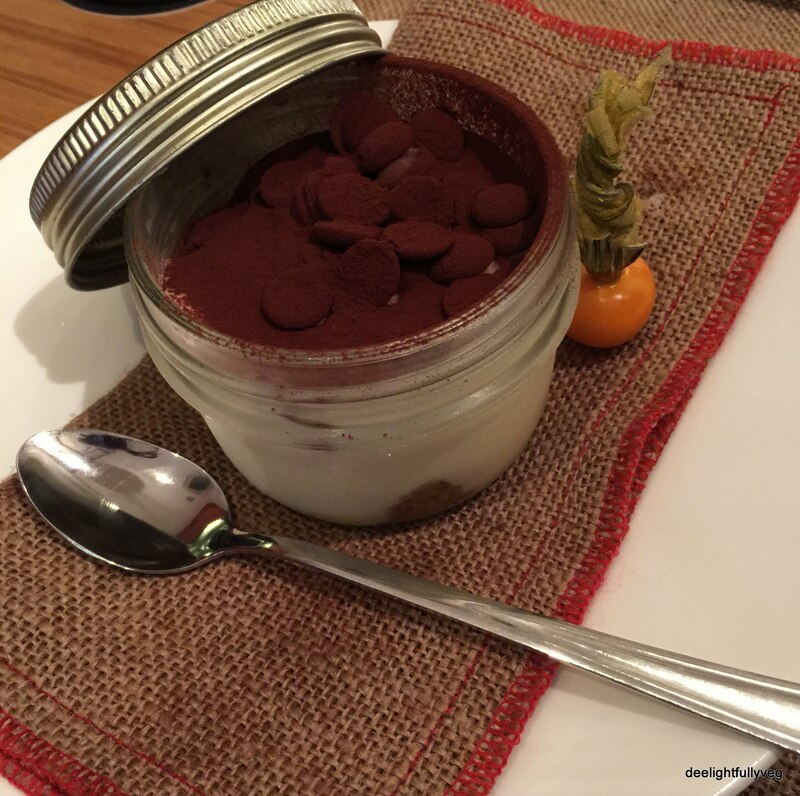 This Tiramisu had a smooth and soft texture and came garnished with cacao powder. The presence of Italian sweet liqueur in the bottom-most layer was distinct and the dessert was delicious on the whole. The ‘Crème brûlée’ had a layer of burnt caramel on the top that could be cut into easily. The egg custard was creamy and red vanilla beans were used for a fragrant taste. If you are not a fan of a strong taste of eggs when used in desserts, then it’s better not to order this dessert. For quality Italian food that is value for money, for friendly service and for their rainbow dough pizzas, PocoLoco Pizzeria is absolutely worth a visit. With Italian restaurants spread all across the red dot island, it would take some thought and planning to open a new restaurant serving this cuisine. My wanderings this time led me to Lucca’s Trattoria, a quaint and rustic eatery located in Robertson Quay. The quadrangle is filled with restaurants – and a lot of people! The moment you enter the restaurant, what strikes you is the long wooden paneled counter, the huge display of wine bottles, the red-checkered table cloths and counter design. The decor definitely helps in setting up a calm, no-frills and private atmosphere. The counter has a light display which shows the trademark Italian specialties they offer and states that they make everything in-house from scratch. While trying Italian cuisine, I like to go for the quintessential classic – pizza. Since they focus extensively in this cuisine, they have a wide range of options on their menu. We ordered the ‘Vegetariano Supremo’ which contained bell peppers, black olives, mushrooms, grilled zucchini, artichoke, onion and rucola leaves. The special pizza grade flour is imported from Italy. The pizza is made in the open kitchen on a oak table top. The crust had a substantial bite to it and the pizza tasted great. It is available in two sizes in case you want to share. There was authenticity in the taste of the sauce too. The house-made pastas are also quite popular at this joint. For my drink, I ordered the ‘Apple Juice’ and steered away from the classic red wine pairing for a change. The juice was refreshing and had the subtle taste of apple to the amount I like. What ultimately stood out in this place were the desserts. This course transported me to Italy as the taste felt authentic and the chef exactly knew the process for making it in a true Italian style. The item definitely not to be missed is ‘Lucca’s Tiramisu’. They make it using Lady’s Fingers soaked in Sicilian marsala wine and espresso. The mascarpone cheese was dense and every bite was like a dream. Overall, it was lush and boozy – and highly recommended. Another yielding to temptation happened after seeing their extensive gelato counter. Prepared by Italian-trained gelato chefs, this has some new flavours that looked exciting. One of my favourites has been the ‘Chocolate Orange’ combination and the gelato was extremely good. The dark chocolate was bitter with the notes of orange cutting through it with elan. Savour every bite of this when you try it! This is a restaurant that aims to bring Tuscany fare to the forefront in Singapore. The real connoisseurs can tell how much they have succeeded in doing that successfully. If you are looking for a nice evening in a homely Italian setting with authentic taste, this place won’t disappoint. They have lunch promo deals at $15 and also a tasting menu that looks promising as a promotional offer. For good service, great Italian desserts, hand-made gelatos, Luccca’s Trattoria is worth a visit. If you are looking for some after-work comfort food or to catch up with friends for dinner, then Tras Street is just the place. The casual Italian eatery, Buttero located on this street serves some great Italian food. The menu has interesting dishes which aroused my curiosity – I just had to try them! The restaurant has an open-kitchen concept where you can see the chefs in action. 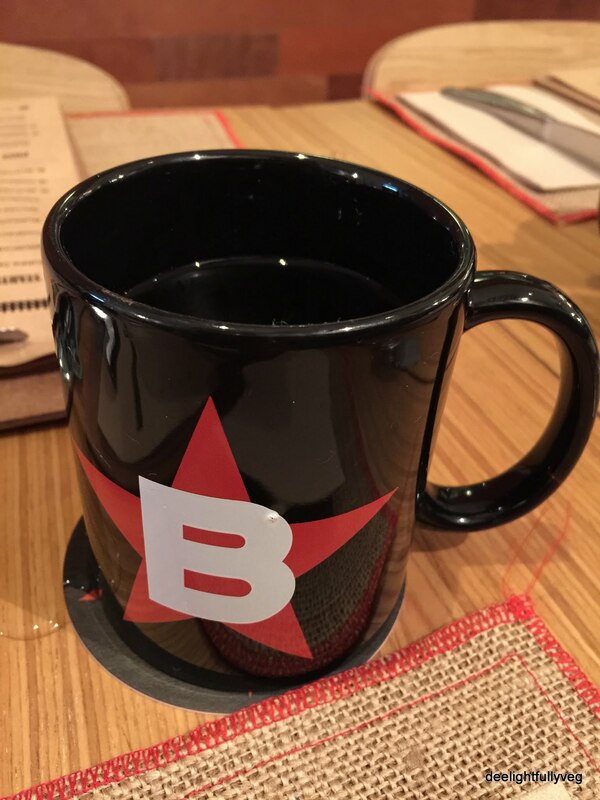 I particularly liked the mug in which water was served as it literally gave a starry feel. 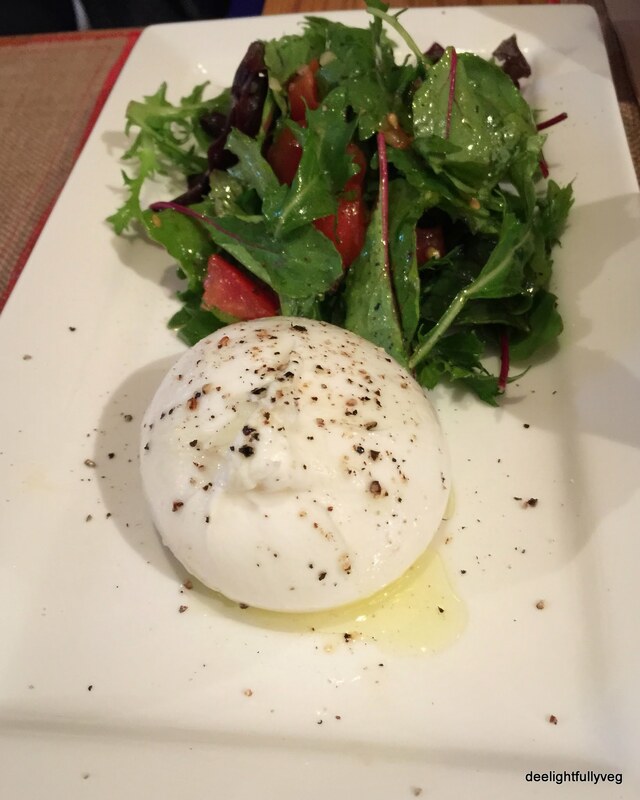 When we chatted with the chef and informed him of our liking for good cheese, he promptly informed us that fresh ‘Burrata Cheese’ was in the offing. We were impressed with the quality of the cheese – it was extremely soft and buttery. It was served with a roasted cherry tomatoes salad. 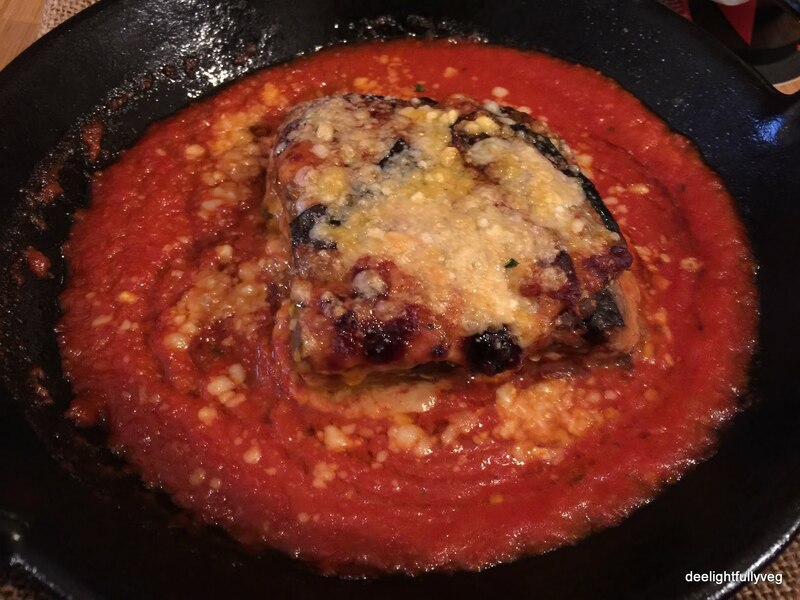 I was interested in trying the eggplant dish called ‘Parmigiana’ which was served in a griddle pan. The grilled eggplant was the star of the dish but I must mention the tomato sauce as the base was delicious. It contained Parmesan in the right amount and was well-seasoned. If you are a fan of eggplant, go for this. In a Italian menu, gnocchi generally interests me because even though it consists of simple ingredients, it is not easy to get it right. 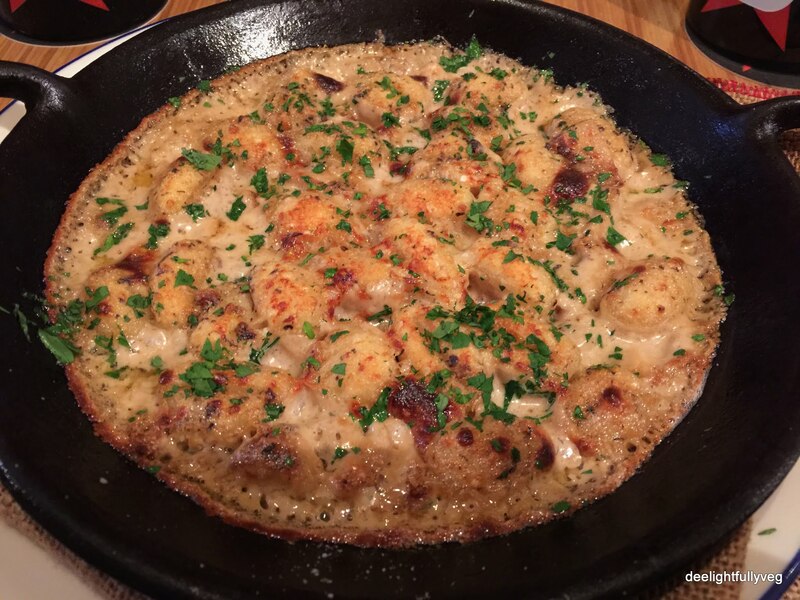 The ‘Gnocchi Gratinati’ was served in a sizzling creamy sauce and was a flavour bomb of cheese, mushroom and truffle. It was rich and very indulgent. 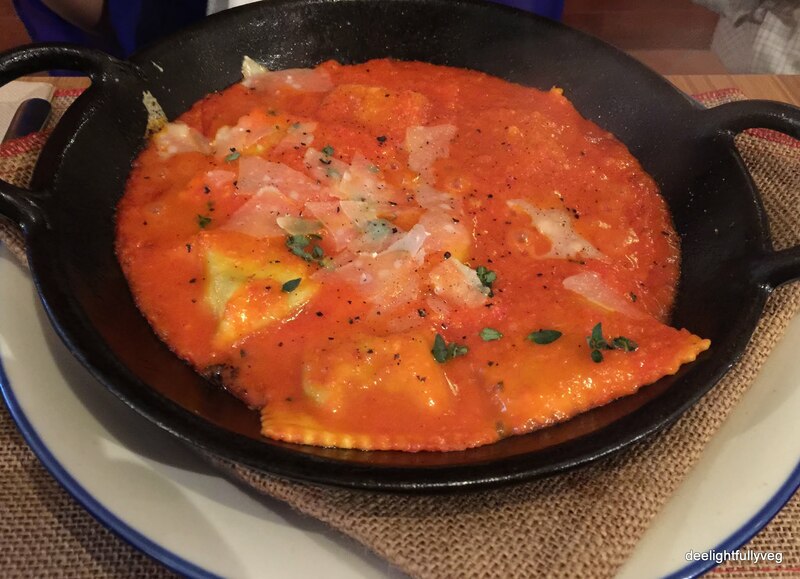 As every dish was tasting great, we also ordered the ‘Spinach Ravioli’. The dough was very good and the ricotta cheese added a perfect taste to the delicious tomato sauce base. You just cannot finish this delicious meal without desserts. Since we were quite full, we decided to go with our favourite ‘Tiramisu’. It was the perfect end to the meal – rich and creamy, with just the right amount of sweetness that pulled you in for the next bite. The best part of our meal was that we could forget about pizzas for a change and enjoy vegetarian Italian cuisine in other forms. For its quality offering in terms of ingredients and taste, Buttero is highly recommended. We were a bunch of friends strolling by the river searching for dessert, and that’s how we found this place is how I would like to describe this France inspired bistro. Situated in Boat Quay, is a small and cozy café called Madame Patisserie which stood out thanks to its styling and theme. This joint has both indoor and outdoor seating. We sat on the white sofa placed on the porch and had a nice view of the river. We were attended to by the smiling staff immediately, and were handed the well designed menus. The logo also had the regal silhouette of a lady on it which caught my attention. We were also promptly informed that additional items not present on the menu were displayed on the counter and we could place our order from there as well. Since we went there post dinner, our appetite was limited. The items mentioned on their traditional menu are a bit pricey but the quantity can easily be shared by two people, hence it evens out. When I went to the display counter, I found their high tea set to be a visual treat. 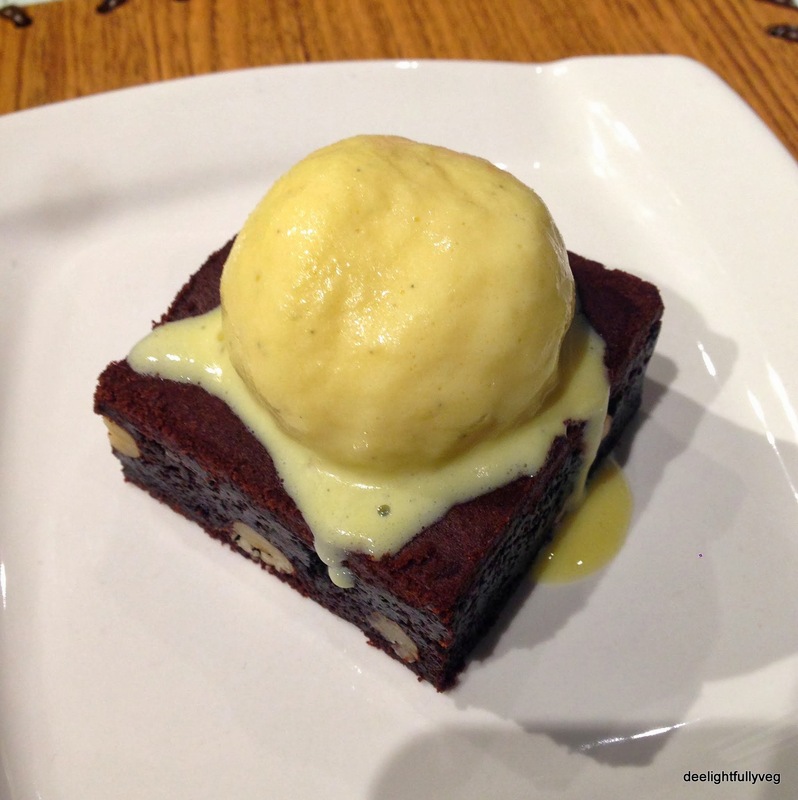 More often than not, ‘Brownie with Ice cream’ forms a part of my dessert order and we ended up ordering it. The brownie was nicely moist and the ice cream provided along with it was a large scoop. Needless to say, we were not disappointed. 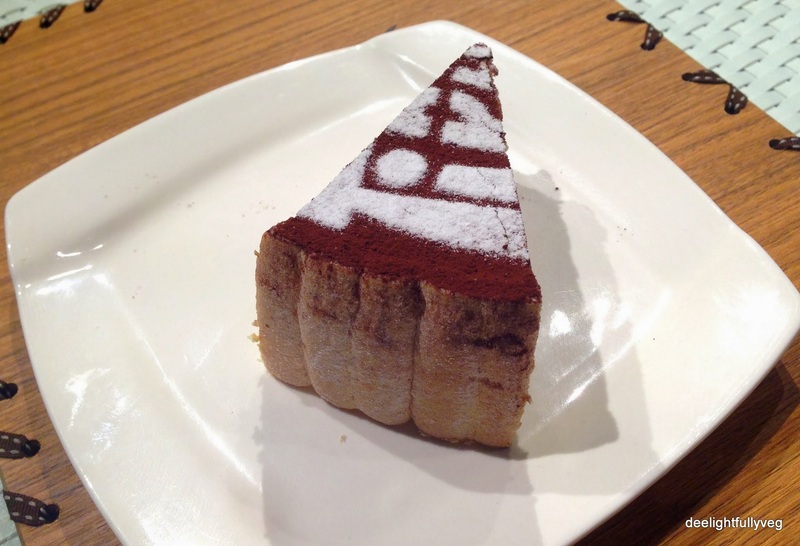 We are always fans of ‘Tiramisu’ and that formed our next order. The coffee and chocolate flavors blended beautifully and it was extremely tasty. It was a sizable portion and it had alphabets on it which made for an interesting visual. 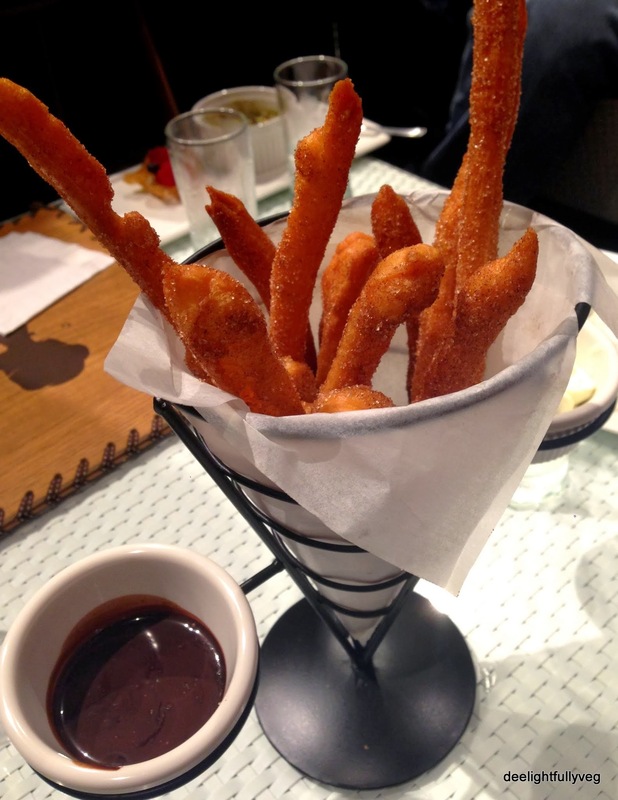 As the desserts started appearing, we went for ‘Churros with Hot Chocolate Sauce and Vanilla Cream’ which was great to munch on. It tastes best when eaten hot, so ensure that you gobble it soon. The cutlery was perfect for the dish. 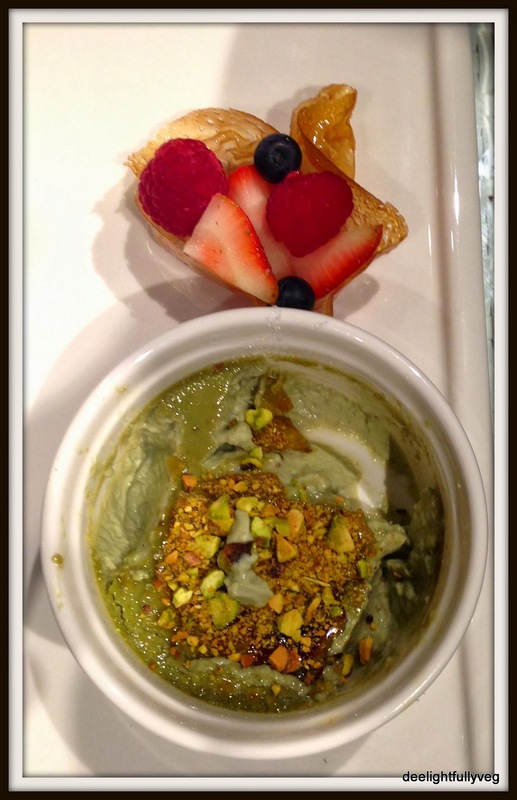 For a deviation from chocolate, we ordered the ‘Pistachio Creme brulée with citrus tuile’ which was …quite different. You have to be prepared for a strong pistachio flavour as that is the main ingredient of the dish. The nuts added a crunchy texture to the caramelized top and the layers were soft inside. Finally we went for the ‘Loaf Cake’ which was a big slab indeed. 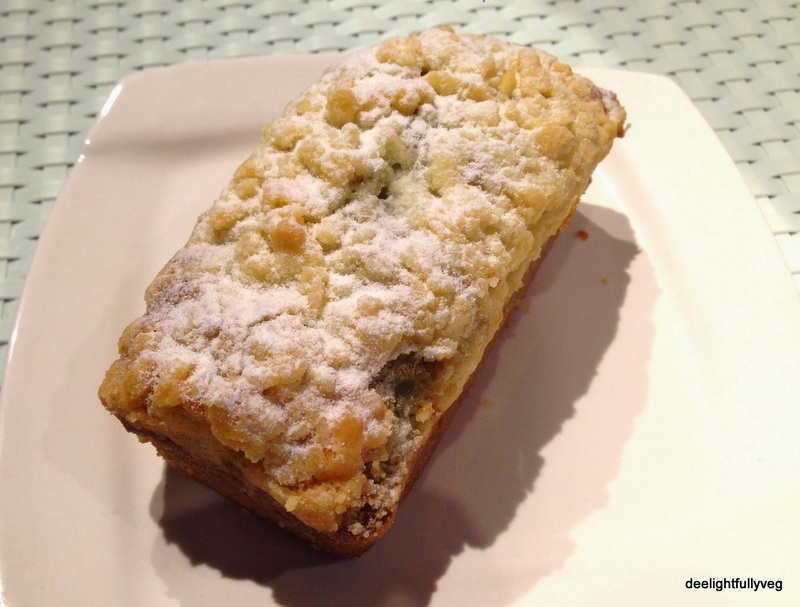 It tasted nice and had a center that had mashed berries – almost like a jam in texture. The crust of the loaf had a nice texture and had a freshly baked feel to it. We also got to know that they have some set lunches and high tea sets which might be useful for those in the CBD area. They pretty much make all their breads, scones, jams etc. 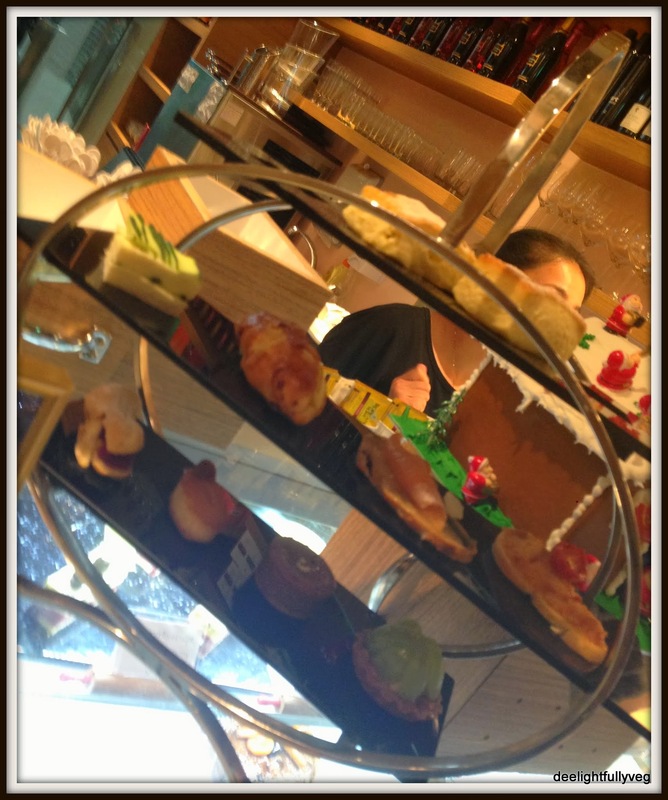 in-house from scratch which gives the place an authentic feel of a patisserie. For the ambiance, dessert varieties, delicious taste, hanging out with friends and family, Madame Patisserie is totally worth a bow – I mean a visit! On that note, Happy Women’s Day to all you wonderful ladies out there.